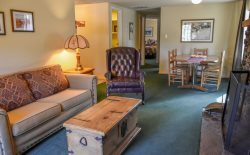 Ponderosa Lodge is a very comfortable cabin-suite in the center of a tri-plex, sharing a covered porch with Aspen and Juniper Lodges. It offers 2 Queen bedrooms and a full-sized sleeper sofa, 1 bath, sleeping a maximum of 6 people. There is a full kitchen, dining room table and an inviting living room with a local-rock fireplace and flat-screen TV. Ponderosa Lodge offers lovely wooded and Capitan mountain range views. Just out your door is the courtyard, with lots of seating for hanging outdoors with family and friends, where you'll find gas grills, a horseshoe pit and the hot tub. If you need more space, Ponderosa, Aspen and Juniper Lodges have interconnecting doors, so you can expand to a 4 or 6 bedroom accommodation. At the front of the property is the Main Lodge, where you'll find the pool table and a very spacious and comfortable living area with beautiful flagstone fireplace. You'll see deer roaming the property and don't be surprised to see the VIPs (Very Important Ponies - the Free-Roaming Horses of Alto) wandering through, as well as the occasional fox, elk, jackrabbits and cottontail rabbits. Bring your camera and your best smile! You'll love the serenity of this semi-secluded location in the tall pines, where you'll seldom hear a car, yet you're only 10 minutes from the heart of Ruidoso!